One of the hardest things for adult leaders to do is watch the boys conduct an activity while knowing it could be done better. 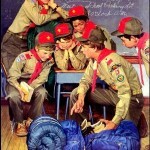 Remember, if boys already knew how to do everything perfectly, they wouldn’t need scouting. Our boys have elected their leaders at all levels. They have been or are being trained to lead. These leaders are expected to lead. There is no greater peer pressure than when scouts feel their leaders are letting them down. There may be times when you might see the adults in the troop standing by and observing. At such times, perhaps you think they should be involved. Herein, however, lies our method… the BSA method: the boys run this troop, with our guidance, and they need to have the freedom to conduct its business their way. You will see great successes and will witness great failures. This is scouting. Avoid the temptation to correct the boys and take over an activity. Stand back, let it fail, and it will become a learning experience. The boys will respect your patience and your confidence in their abilities. The only instances when adult leaders should and do step into a situation is those that involve the health/safety of the boys or morally inappropriate behavior is occurring. Every adult in our troop is responsible for the safety of the boys.